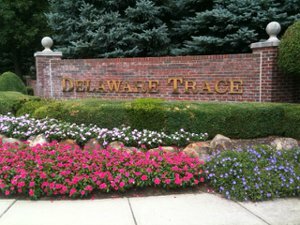 Delaware Trace is an upscale neighborhood in Carmel, Indiana. The subdivision features custom built homes, and is located north of Main Street (131st) along Hazel Dell Parkway. Homes range in price from $400,000 to $900,000. Most homes are brick and have well-tended landscaping on large lots. Delaware Trace is close to shopping and dining, as well as being convenient to golf courses. The neighborhood has a community pool, nature trails, pond, clubhouse and playground. Students attend Carmel schools, specifically Prairie Trace Elementary, Clay Middle and Carmel High Schools.